The National League Central isn’t a division you think about when you think about powerhouses, but it features a couple really good teams who made it into the playoffs last season. It wasn’t a big offseason in the Central except for the loss of the Astros. Man, they’re gonna miss those guys! 2013 should be much like 2012, but hey, what do we know. Here’s how STT sees the NL Central shaking out. The Cubs are on the right track and their pitching staff isn’t half bad. They’re a year or two away and they have some players worth watching on the north side of Chicago, notably one of my favorites, Anthony Rizzo at first base. With Theo Epstein and Jed Hoyer at the helm, the Cubs are heading back to prominence, but it won’t be this year. The Brewers are a lot of people’s pick to surprise in 2013. They have a pretty good offense, but I can’t get behind their pitching depth and man, the bullpen looks pretty weak. They have one of the game’s best players in Ryan Braun and some other players who could make the Central interestiof the game’y one of my favorites, Anthong if they can produce at career levels. The Brew Crew won’t be embarrassing by any stretch, but I don’t see them contending in a meaningful way. This is the year! The Pirates are going to finish above .500. They will. Don’t get me wrong, this is a team with a lot of upside, but not a lot of players who are sure to produce. If they can get some life shot into them from the farm system, the Pirates should be good enough to hang on the peripheries of the playoff race before falling off down the stretch again. The Cards are a really good team with a lot of pitching depth and a well-rounded offense. They also have some sort of deal with a higher power given the way the last two postseasons have gone for them. Even without Chris Carpenter in the fray, they’re still a great team with a lot of good players. If the Cardinals are really good, the Reds are great. They’re average or better everywhere on the field and their rotation was excellent last season and has Aroldis Chapman coming to make it even better. You wonder about the outfield defense with Choo in center, but other than that, this is a team that looks like it could only be stopped by injuries. Plus, have you guys seen Joey Votto. That dude is incredible. Storyline that Will Surprise Us: Choo will survive center. 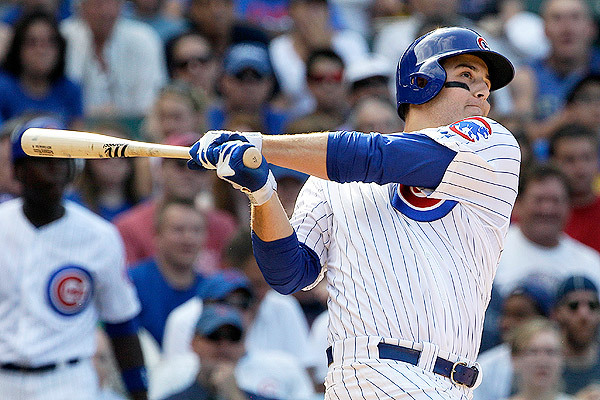 Boldest of the Bold: Anthony Rizzo will finish in the top ten of the MVP race. On Monday, STT previewed the NL West. Today, the Eastern division in the Senior Circuit is on tap. 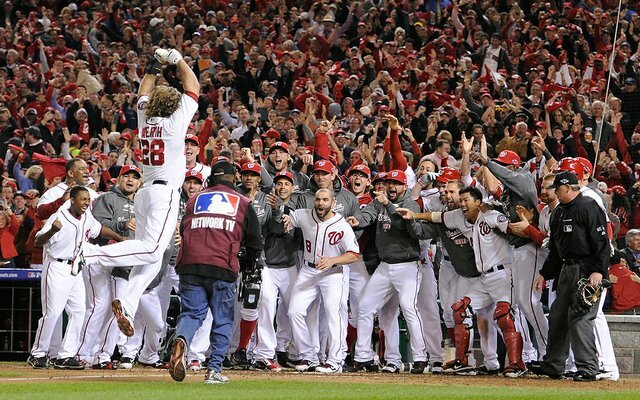 Last season the Nationals surprised many (but not me, they were my pick to win the division) by accumulating the most wins in baseball, while the Braves made the fake playoffs and lost a coin flip game that featured garbage being thrown on the field. The Phillies disappointed and the Mets made a pretty good first half run. The Marlins stumbled and then blew up their franchise in a way only the Marlins could. The Nationals and Braves both had big offseasons while the Phillies did weird stuff like signing Delmon Young to play defense. The Mets dealt Dickey for a good haul and extended David Wright. The Marlins traded everyone who isn’t Giancarlo Stanton, and he’ll be gone inside twelve months two I’m sure. I’ve made no secret of my disgust with the Marlins fire sale over the last several months and won’t rehash it at length here. They have but one player on their entire projected opening day roster that is a lock to have a 2 WAR or better season if healthy. Only Giancarlo Stanton is anything more than a bench type player going into 2013. They will no doubt have some surprises and I’m excited to see former Tigers Jacob Turner and Rob Brantly get a shot at the big leagues, but this team is so devoid of talent it borders on the criminal. I’m actually kind of bullish on the Mets. I think their rotation of Santana, Niese, Harvey, Gee, and eventually Wheeler could be very good and they’ve made some good bullpen signings. David Wright is a centerpiece and they have some good supporting pieces in guys like Ike Davis and Daniel Murphy. The Mets need an outfield. I think they’re one great player and one pretty good player away from being a legitimate contender and maybe only one good player away from making noise. Even if they don’t make a playoff run, I’m excited to watch the Mets rotation in 2013. The Phillies rotation is too amazing at the top for them to be any lower on this list even if the rest of the team is questionable. Up the middle, the Phillies can play with anyone with the likes of Carlos Ruiz, Chase Utley, Jimmy Rollins, and Ben Revere to match Halladay, Lee, and Hamels. The problem is that the corners are potential black holes of terrible. Michael and Delmon Young are written in as starters for 2013 and they were literally among the five worst starters in baseball last season costing their teams more than two wins combined. Ryan Howard has been a bit of problem at first given his lack of four tools. Each of these players could have bounce back years, but I’m not betting on it. The pitching and the middle will hold the Phillies up, but they won’t make it to the top. The Braves added Uptons for 2013 but lost Chipper Jones and Martin Prado, which makes me think they’ll be about as good in 2013 as they were in 2012. Which was good. The Braves have a great outfield and infielders who have the potential to really contribute. Their starters are solid and their bullpen is second to none. The Braves are a well-balanced club with no glaring holes. Other than Dan Uggla’s defense. I’ve also made no secret of my belief in the Nationals on these pages and this is merely a formality. They were baseball’s best team last season and got better by any definition. Even if you expect regression by some, you should probably anticipate improvement by others. Their pitching staff is only challenged by the Tigers and Rays for the best in baseball and the Nats have a good bullpen and well-rounded offense. It’s hard to imagine a scenario without disproportionate injuries that doesn’t have the Nationals among the best teams in baseball for 2013. Division Storyline that Will Surprise Us: Chase Utley stays healthy and has a big year. Boldest of the Bold: Freddie Freeman will make the All-Star team. If we knew nothing else than who won the World Series every year, the National League West would look as if it was doing pretty well for itself as it is home to two of the last three world champions. Both of those teams are the San Francisco Giants, however, so it’s probably better for everyone if we had a little more information. The division features those defending champion Giants and baseball’s newest quarter billion dollar payroll, the Dodgers. Both clubs have their sights set on a playoff run and they will have company. The Diamondbacks made a lot of roster juggling, win now type deals this year and the Padres had a good run to end 2012. Only the Rockies can be said to have no realistic playoff hopes for 2013. The division features big ballparks and could be a growing challenge to baseball’s previously elite divisions in the years to come. For now, it remains a bit off the pace in my book. Here’s how SABR Toothed Tigers sizes up the NL West for 2013. The Rockies had a bad season in 2012 and didn’t do a whole lot to make their team better for 2013. The offense, with a healthy Tulowitzki, is formidable enough to contend, but they cannot do it alone. The starting rotation and bullpen, even with generous adjustments for the tough home ballpark, are abysmal. The Rockies have a number of guys I would feel comfortable placing at the back end of my rotation, but none who belong at the front. If the Rockies won more than 75 games in 2013, I would be absolutely shocked. As you can see by my preseason ranking, I think the Rockies will be among the worst five teams in baseball this year. The Padres played much better in the second of half of 2012 and actually looked like a team that could contend in 2013 with a few upgrades. Unfortunately, they didn’t make any big upgrades. They took some chances on previously injured starters who could certainly provide good value, but no one who will be a bona fide difference maker. With some good fortune, the Padres should spend a few months kicking dirt around the second wild card, but the talent just isn’t there without a couple more acquisitions. The Diamondbacks have a talented roster, but also made some strange moves this offseason. They traded Chris Young, Justin Upton, and Trevor Bauer for a return of Martin Prado, Didi Gregorius, Heath Bell, and Randall Delgado. There are a few more pieces as well, but these are the ones who look to make an impact this year. They signed Cody Ross and Eric Chavez and have good pitching depth coming from the system to go along with centerfielder in waiting Adam Eaton. On the whole, this is a talented club, but they seemed to get the worse end of every move they made. That doesn’t mean they’ll have a bad season, but it does make you wonder how well the team is run. I wouldn’t be surprised by a playoff push from the Dbacks, but it will require another big year from Aaron Hill and Paul Golschmidt in addition to solid seasons from a lot of lesser pieces. The key will be how well a deep but inexperienced pitching staff can navigate through a full season. This is a good team, but not a great team and their record will reflect that. I’ve written on several occasions that I don’t think the Dodgers have successfully spent their way into a playoff berth, but rather have merely allowed themselves to get into the discussion. Their top two starters, Clayton Kershaw and Zach Greinke, are phenomenal, but the rotation is uncertain after that despite a number of options. Carl Crawford claims he’ll be ready by Opening Day, but I’m doubtful we’ll ever see him regain his Tampa Bay form. Matt Kemp is coming off an injury plagued season and Andre Either’s and Adrian Gonzalez’s best days are behind them as far as I’m concerned. This isn’t a bad team, but this is not the best team $250 million can buy. The Dodgers should be in the playoff chase right down to the wire, but they’re not going to make into October. The Giants have earned this spot in part due to history and in part due to reason. As far as history is concerned, they’ve won two World Series in three years and are due some deference for that. Rationally though, they won the division last year and return the same team minus a half season of Melky Cabrera and plus full ones from Hunter Pence and Marco Scutaro. The Dodgers may be better than last year, but they also had an unusually lucky first two months last year, so that might balance out. It’s also hard to imagine Tim Lincecum doing any worse than he did in 2012 and could reasonably do much, much better. The Giants aren’t the most talented team in baseball for 2013, but they have shown the ability to exceed our expectations of them. This is a team that plays good defense and pitches well, but they are also a better offensive club than they were in 2010 when they played “torture baseball.” Buster Posey will lead the way, but he won’t be on his own. The Giants aren’t my pick for the World Series, but they are my pick to represent the NL West in the postseason. Division Storyline That Will Surprise Us: The Dodgers will be desperate for pitching by June. Boldest of the Bold: Carl Crawford will be a platoon player by August. While SABR Toothed Tigers is a Tigers website first and a baseball analysis site second, it is, third, a place for insight into the more relaxed side of the game; enjoying baseball. In that domain, from time to time I like to write about things that could help you enjoy the sport I love more. This is one of those things. This is a Ballpark Review. I’ve been to seven living and two deceased major league baseball stadiums and a nice chuck of minor league and college venues as well (Editor’s Note: The author can also provide detailed analysis of NW Ohio’s NLL high school stadiums). One of my more serious lifelong goals is to see a game in every major league park. With that in mind, here are my thoughts on one of the seven MLB stadiums still standing to which I’ve been. Nationals’ Park is out in the Navy Yard district of DC which is a ways away from most of the tourist type destinations associated with that city. That said, it is just a short walk from the Metro which you can pick up conveniently in most parts of town. DC locals complain a great deal about their city’s subway, but in four trips to DC, I’ve never found it to be much of a problem. It probably helped that I was visiting rather than depending on it for daily transportation, but this is a review for people going to DC for baseball, not for people deciding where to buy a house. From a visual perspective, the park is solid. There’s a pleasing mixture of red, white, and blue to go along with an open view from left field and a higher seating and scoreboard area to right. The scoreboard is one of the larger ones I’ve seen and the park is devoid of any serious viewing obstructions unless your seat is next to the foul pole. On both trips, I sat in the lower deck and the view of the baseball itself was great. I didn’t feel crammed in my seat and the aisles were large and accommodating. The food selection is diverse and above average in my book. The park features a number of exhibit type areas to learn about the history of baseball in Washington, but well, it’s hard to make that look impressive. The pricing is bit on the high side, but DC is a fairly expensive area and the park was publically financed, so it’s not that surprising given that the team is finally becoming a force on the field. Nationals’ Park is a doubles hitter as a stadium. There’s nothing wrong with it, it’s just nothing special. Seeing a game there is a pleasant and fun experience, but I never leave wanting to talk about the park. There is no breathtaking view or superb food or excellent quirk. The only remarkable thing about the park is the President’s race, which is funny, but just as good on television and has little bearing on the park itself. The Nationals are an exciting club to watch and their stadium is plenty nice, it’s just nothing special. It lacks the charm of Wrigley, the presence of Comerica, or the majesty of PNC. It’s a good place to watch a baseball game, but is there really a bad place to watch baseball? If you’re going to DC, I recommend a game there, but don’t go out of your way just to catch a game in DC. If you’re planning a baseball specific trip, there are better places to go. Compiling a list of The Nine best left fielders proved interesting this season because so many of the players on this list were not full time left fielders last season. By my count, three or four of the top nine spent time at a different position in 2012 and as of this publication, they are not all 100% locks to play left field. If you’re reading this during the season and are like, “Hey, #1 plays centerfield!” you might be right. Please take the positionality of the outfielders with a grain of salt. That said, this was a very deep list. Apologies to many who didn’t make the cut. Prove me wrong and end up on next year’s list. Now it may seem strange to have the ninth spot go to two players, but I’m just not sure which Yankee is going to be in left field this season and either one would fit right here on my list, so it’s both of them. Whichever plays there, lands here. Granderson hits for power, but Gardner is much better at getting on base and plays a much better defense. Both players have great aspects of their games and both have weaknesses. Cespedes hit nicely in 2012, but missed 33 games and played below average defense. It’s hard to be sure about those flaws because we don’t have any great data from his time playing in Cuba, but he has all the necessary tools to excel in the majors. My hesitation with him is merely that I don’t have nearly as much information about him as I do for everyone else on the list. If he repeats his 2012, he’ll move up the list quickly. CarGo’s place on this list is really a testament to his contemporaries rather than a knock on him. He’s on base a lot and hits for power to go along with some good baserunning chops. His defense is something of an open question because certain people love it and certain people hate it. Gonzalez gets help from his park to some degree, so that will cost him just a spot or so on the list. Great player, but not a top five left fielder for 2013. Upton still has his prime ahead of him and is moving to the Braves and left field to play with his brother, but he also had a rough season in 2012 compared to a great 2011. Most people see the talent and expect great things, but he also seems to have developed the reputation as an underperformer. The change of scenery should be good for him because his coaching staff and front office won’t be looking to trade him every day. A good season for Upton is ahead, but not a great one. Holliday is a great and consistent offensive performer and is just starting to slow down defensively at 33. He’s the centerpiece of a great lineup and hasn’t been worth fewer than 4 WAR since 2006. The ceiling might be lower than Upton, but the floor is higher. Gordon took a while to arrive relative to expectations, but he finally did in 2011 and followed it with a great 2012. He’s a gold glove defender in left and does everything well. Power, speed, and discipline mix nicely in Gordon and for my money, after Ben Zobrist, is probably baseball’s most underrated player. The Royals might not have enough to contend this year, but they have a star in left. Harper is another player moving to left this season, and he’s doing it on baseball’s best team. He had a great season for a teenager at 19 and another year under his belt should only make him better. Harper is often referred to as a generational talent, but even if he isn’t Mantle or Mays, a single step forward from last season should be enough to put him near the top of this list. Harper does everything well and should be at the top of this list for years to come. Ryan Braun is arguably baseball’s best all-around player. He is an MVP at the plate, runs the bases well, and is consistently improving his defense in left. He’s entering his prime despite having a collection of elite seasons already under his belt and has never missed more than twelve games in a season in five and a half big league seasons. The fact that Braun is second on this list despite that resume tells you something about the man ahead of him. Mike Trout had an all-time great season at 20. The guys who do that, tend to be all-time greats. He hit for power and average, ran the bases as well as anyone in the game, and was among the very best defensive centerfielders in the sport. He was, by far, the best player in the league in 2012. That performance is not something you can easily duplicate, but even 75% of what he was last season would be enough to challenge Braun for first on this list. If Trout was half as good as he was last season, he would still be a perennial all-star. Mike Trout might not be the best player in the league for years to come, but it’s hard not to dream on his talent and get caught up in his 2012 season. Lost in this love letter to Trout is that there is a player on the Angels who is good enough on defense that he is pushing Trout to left in 2013; Peter Bourjos. Trout is the best left fielder for 2013 only because there is someone on his team who is a better defensive centerfielder than he is. Pretty amazing. Like this list? Hate this list? Have a more nuanced feeling about this list? Join the discussion in the comments section or on Facebook and Twitter. Which got me thinking, if Leyland progresses at this rate, it is possible that he could join Twitter one day. Last year, at one point during a fan mutiny, Leyland wanted fans to e-mail their lineup choices to members of the media to show him so that he could get their input, if they were so smart. But what if we could tweet with Jim? His son and Tigers minor leaguer Patrick is on Twitter, so presumably someone could help him out at home. And several Tigers players are “Tweeps,” including Paws, the Tigers’ mascot. Could we soon be living in a world in which Jim Leyland tweets? His mixture of sage wisdom and nonsensical clichés are exactly what you need to be successful on Twitter, or really the internet in general. Additionally, I would be very interested to see how mumbling sounds in 140 characters and if he would tweet about things that make him emotional. But most importantly, he could tweet out his lineups ahead of time so that fans could critique his managing in an interactive way. In fact, can you think of any person currently without a Twitter page that would be more entertaining to follow than Jim Leyland? I sure can’t. This needs to happen. 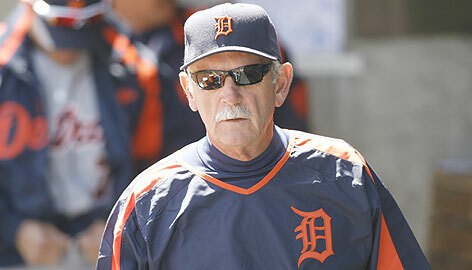 Jim Leyland belongs on Twitter. Don’t you agree? 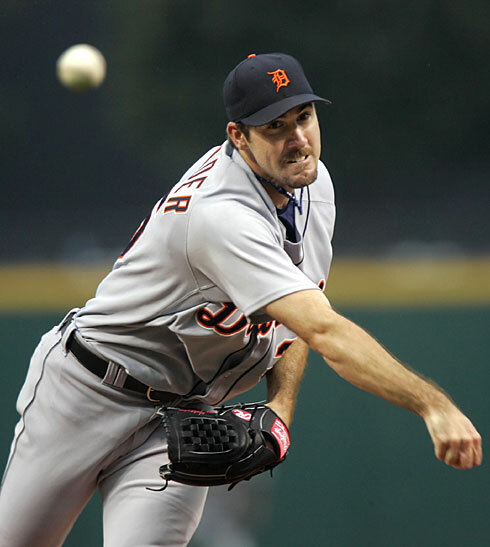 Yesterday, beloved Tigers ace Justin Verlander turned thirty years old. He accomplished a great deal in his twenties such as winning two pennants, Rookie of the Year, the Cy Young, and an MVP award to go along with 124 wins (39.3 WAR) and the title of best pitcher in baseball. Sometime in the next two years, he’ll also likely sign the largest contract ever given to a pitcher. Verlander is an extraordinary pitcher and we love him for that, but Justin Verlander is also extremely terrible at something. Hitting. Put more clearly, Justin Verlander accumulated exactly zero hits before his 30th birthday. He’s 0-24 with 9 sac bunts, 14 strikeouts and one GIDP. That is a very bad stat line if you’re not familiar with baseball. His triple slash line is all zeros and his wRC+ is -100. League average is 100 (notice the absence of a minus sign). Well, so what, AL pitchers can’t be asked to hit, right? Well they have to hit a little bit. In 2012, AL pitchers made 319 plate appearances (about half a season for a standard position player) and posted a .122/.143/.129 slash line. That is very bad by any field player standard, but it is a line of which Verlander can only dream. Over the last seven seasons (JV’s career), AL pitchers hit a collective .118. He has hit .000. So to even be average among his peers, Verlander should have between two and three hits in his career. Of course it’s a small sample, but this is a fun post, so we get to ignore that. Let’s go further, since 2006, 29 pitchers have twenty or more plate appearances in an AL uniform. Guess how many don’t have a hit? Two. Only Verlander and Jon Lester. Only Lester, Kevin Milwood, and Tim Wakefield have more strikeouts than JV. So while, AL pitchers are rarely asked to hit, the AL’s best pitcher is probably one of the league’s very worst hitters, even among his peers. Justin Verlander is spectacular at many things, but hitting is not one of them. He has two no-hitters and only four men have three. It would surprise no one if he joined that group this year. But could 2013 be the year he finally gets a hit? That seems like a longshot. The league’s best pitcher is quite possibly the league’s worst hitter. Now, who wants to tell him? Anthony Castrovince of MLB.com wrote a piece recently wondering if any AL Central team could challenge the Tigers for the division title and specifically referenced the Indians acquisition of Michael Bourn and Drew Stubbs this offseason, which provides them with a great deal of speed. But the Tigers’ returning DH and former catcher has a word of warning for the base swiping inclined Indians outfielders. It’s a wonderful note of support from V-Mart about Avila, but is it accurate? We know catcher defense is the most difficult defense to measure and clunky things like fielding percentage and caught stealing percentage just don’t do it. The best we have so far is Defensive Runs Saved (DRS). 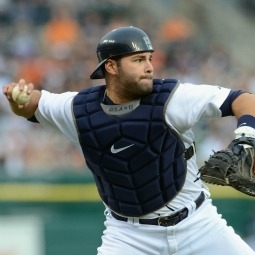 If we accept DRS as the best we can do without detailed scouting reports, how does Avila stack up? In 2012, he was tied for fourth best in baseball with 6 DRS at catcher trailing Ryan Hanigan (7), Salvador Perez (9 in 653 innings), and Yadier Molina (16). So, don’t trying anything Indians or you’ll have to deal with this. Last Friday, MLB Network completed their Top Ten Right Now series with a look at baseball’s best ten managers. The series was informed heavily by Clubhouse Confidential’s “shredder” which uses an objective formula to determine player value much like Wins Above Replacement. But this gets sticky, as they admit, when it comes to managers because it’s very hard to determine what managers should get credit for and for what they should get blamed. So I started thinking about what it would look like to quantify manager value. We have a great set of offensive and pitching statistics that quantify player performance and an increasingly good group of stats to measure defense, but what do we have that measures what a manager does? Let’s first ask the question, what is it that managers do? This is definitely the hardest piece to measure. How do we quantify that which we cannot observe? And even if we did observe it by being inside meetings and next to the skipper in the dugout, how much does this leadership matter? It’s conventional wisdom that this aspect of the job matters a great deal and that players often improve and weaken their performance based on how well a manager motivates and leads. A good number of people in the analytic community scoff at this notion because world class, competitive athletes are already so far to the right on the distribution of talent that this type of leadership shouldn’t be terribly effective at making a noticeable difference in performance. I tend to see a big role for leadership and motivation because this also includes communicating with players about their roles and what is expected of them. In general, this aspect of managing is important, but very hard to measure. Let’s leave this aside except to say that managers who are good leaders will get outcomes no worse than those who are bad leaders. This should be much easier. Putting the right people in the right spot in the lineup and calling on the right players to pitch at the right time is a very important aspect of the job. Hitting your best hitter in the right spot is a better choice that hitting them ninth. Most in the statistical community would argue for putting your best hitter second, but we’ll setting for third until we win that war. You can also add value here by platooning the right players and giving players appropriate days off too. On the mound, knowing when to pull your starter and knowing which reliever to use when is perhaps the place a manager can do the most good or harm. I’d be curious to see how much an optimal lineup could improve a team over worst case lineup. But on the other hand, no manager would actually use the worst possible lineup. How many wins can be gained between optimization and ordinary? That’s the question we have to answer. The pitching side would be tricky, but it is possible in theory. What we need is to gather leverage indexes of every plate appearances and then somehow compare those indexes to the outcomes in cases when the manager makes a move and when they don’t. This could be problematic, because managers can only make a move if they have the right personnel on the roster, but we could find a way to compare these moves to each based on the roster they have. I don’t have a formula in mind, but I think evaluating each pitching change and non-pitching change and the outcome on the next series of at bats would be the proper way to look at this if we created some sort of constant that accounted for the best a manager could do with the team he has. Neither of these ideas are fully formed, but it should help us understand managers just by thinking about what it would look like to measure them. Strip out the personnel choices and managers have moves to make like calling bunts, hits-and-runs, and stolen bases. Two problems emerge. The first is obvious and unavoidable, sometimes players do these things on their own. Can’t do anything about that. Let’s move on. The second issue is game theory. How is it that we can judge a manager based on incomplete information? If a manager thinks a stolen base is a good idea, he is weighing the likelihood of success given what he anticipates the other manager will do (pitch out, pickoff, nothing). The problem here is that if Manager A calls for a steal and it works, it might work in spite of the fact that he made a bad choice. Manager B may have called for a pitchout, but the catcher may have dropped the pitch. In this case, Manager A made the wrong call, but got the right result. How do we account for that? It’s tough. You’re starting to see why this is so hard. So managers are leaders, make personnel choices, and make in-game strategic decisions. The first hard to measure. The second is easier, but requires a lot of complicated math. The third is pretty easy, but requires us to control for what the other manager does, which is theoretically quite problematic. But just in thinking about these aspects, it gives us a more formal understanding of what we are looking for and allows us to better evaluate managers using the tools we do have. I know that’s a really lame answer, but it’s a good one. Two issues emerge. The first is that I can’t watch every manager enough. I can watch my team’s manager very closely and judge him well, but I can’t watch all thirty. The second issue is objectivity. Your eyes aren’t as objective as a more math-y approach, but a math-y approach isn’t without bias. The best way to evaluate managers, for now at least, is to think very formally about what managers do and then judge them with your eyes. We want to see managers bringing in relievers at the right times. This requires us to decide before every hitter whether or not we think he should go to the pen. We can’t judge him by saying, “I knew it!” We have to say, “he should pull his guy now,” and then see how often we are right and how often he is. We have to manage alongside him, not in retrospect. We also need to understand strategy better by looking at Run Expectancy Matrices and considering how likely a given outcome will be and how often the managers play the high probability moves. None of this is easy, and it is very subjective, but as my Game Theory professor says, formalizing allows us to isolate that which we are debating and allows us to have specific conversations about the items of interest to us. In English, when we decide what we are looking for before we go looking for it, we can measure our expectations against the outcomes to see if managers are getting the most out of their players. While we probably won’t ever have a WAR for managers, this discussion will hopefully help you better judge your team’s manager. Try it out and let me know what you think. For reference, I’d say Jim Leyland is top notch at leading men, pretty good at offensive personnel, good at deciding when to pull the starter, shaky when it comes to using his bullpen, and average when it comes to in-game strategy. Tell us what you think about grading managers by typing it on your “Hand Computers.” Bonus Points if you know from where that reference originates. On Monday, ESPN completed their journey toward becoming the network with the worst baseball coverage. While the quality had been deteriorating for a long time, it finally went over the edge when the powers that be cancelled ESPN’s Baseball Today podcast and replaced it with ESPN’s Baseball Tonight podcast. Now the name change might not seem like something getting worked up about if you weren’t a regular listener, but I assure you the entire nature of the program was altered into something perfectly ESPN, which means it is perfectly terrible. Baseball Today had been “on the air” for the last five years, but existed with its current roster for the last two and a half. The show was hosted by ESPN Fantasy Baseball writer Eric Karabell and co-hosted by ESPN Stats and Info researcher Mark Simon (Monday and Friday) and ESPN senior baseball/prospect analyst Keith Law (Tuesday-Thursday). The show featured smart, analytical discussions about baseball that covered the entire league (read: not just the Yankees and Red Sox) and embraced sabermetrics and statistical analysis in addition to Law’s scouting chops. It was an excellent program for baseball fans of all stripes because it blended all kinds of baseball discussion ranging from The Ridiculous Question of the Day to analysis of market inefficiencies. It also helped that the personalities meshed well together and were all genuine fans of the sport. They didn’t grow up as journalists, they grew up loving the sport. Naturally, ESPN ruined it. My general complaint with ESPN’s sports coverage is that they spend too much energy focusing on uncovering “scoops” through “sources” so that they can bring you sports news first. When it comes time for analysis, they product is pretty awful. For the most part, the people they pay to comment on sports either speak only in clichés or know nothing about the thing about which they are paid to speak. That’s pretty much every analyst on ESPN. There are occasional exceptions, but almost all of their coverage is reporting, speculation, and this type of analysis. And it’s just not interesting. It’s not analysis, it’s just Olney reporting on stuff he hears. And then he asks people what they think about something and you get the same tired clichés you hear on BBTN. So the podcast went from interesting analysis like Law breaking down a pitcher’s mechanical problems or Simon providing a very interesting observation about how a player performs against a certain type of pitch in a certain location to more driveling nonsense about contracts and whether or not A-Rod is a distraction. While my distaste for this type of content is likely clear by now, I think it is important to ask a follow up question. Why did ESPN make this change when they had so much content like this already? Olney has a blog. They have the TV version of BBTN, there are countless other ESPN reporters doing TV spots with the same type of coverage. The Baseball Today podcast was the one place for the baseball fan who actually cared about smart, savvy baseball analysis and they got rid of it. Mind you, they didn’t just add a new podcast for Olney, they cancelled the old one too. Someone at ESPN decided that it would be a better move for the network to cancel Baseball Today and replace it. I don’t get it. Why is everyone so obsessed with sports and entertainment “scoops?” Is it so important to know all of this inside information and speculation? What do we gain from Olney having an entire podcast in addition to his writing and TV work to tell us random things people in front offices tell him? We’d be so much better off hearing from smart people like Karabell, Law, and Simon who talk about interesting aspects of the game. So I’m upset about this, you can tell. I wanted to write about it to criticize ESPN for being the worst network on Earth, but I also wanted to do it to let the Baseball Today cast know they put on a good show and should still be on the air. We, your listeners, will miss you. But additionally, I have to share my thoughts about why ESPN made this move. I know they favor scoops and such over analysis, they have for a long time. But I also kind of think this was a subtle statement and punishment from the ESPN bigwigs. A punishment for what you ask? I think this is a backlash against the Baseball Today crew for going too far into sabermetrics and supporting Trout over Cabrera in the MVP race in 2012. That may seem silly to you, given that a billion network couldn’t possibly care about something so small, but I think they did. I think they saw their fan base get really upset at people who didn’t buy into the Triple Crown as a narrative in support of Cabrera. ESPN is a hype machine and their baseball podcast was going against the hype. They were a voice for the rational and analytical rather than the good story. I don’t think ESPN liked that at all. I think ESPN thought these guys weren’t company men because they were outside of the ESPN way of thinking, which is to develop inside access and get us scoops, and after that, follow the story we’re selling. Now I don’t think it was so nefarious in the sense that the people who made this decision actually calculated this all out, but I think it subtlety informed their opinion of the Baseball Today podcast. This was a group of men talking about sports in a way that was very un-ESPN. So they were. And Baseball Today is dead. The Bias Cat has been slaughtered for the final time and ESPN has completed its fall. I listened to the new podcast for a week and probably won’t go back. I might try it out once games start to see if it changes at all, but it’s really mindless news headlines read aloud by ESPN’s top reporter. And that’s the thing. Olney isn’t a bad reporter at all, it’s that a reporter shouldn’t be hosting a baseball podcast. Those of us who listen to this type of thing do it for commentary, not for news. We want to be entertained during boring points in our day (I listen on the ride home from work and while I’m at the gym). News comes in other fashion and the podcast plays on our iPods hours after its recorded, so we’ve already heard most of what Olney is reporting on through other means. Maybe, I’m overreacting. Well, I know I am given that this is 1,300 words about a podcast, but I think the point holds up. ESPN ruined a good thing for no reason. They could have kept the old one and launched the new one. They’re still paying all of the previous contributors to work on other things, so it’s not like this was a cost cutting move. This was a programming choice and a bad one. Maybe this says more about how I’ve changed than it does about how they’ve changed, but I don’t think it does. Five or six years ago, almost all of my (non-live game) sports content came from ESPN. After the Baseball Today podcast died last week, exactly zero will. Other than live games that can’t be watched anywhere else, I will not consume any ESPN content or products. This was the network that changed everything thirty years ago, now it is utterly unwatchable.